I'm told that this is the towns claim to fame. 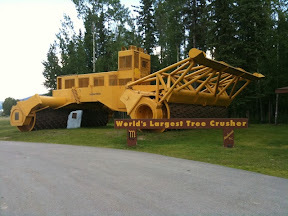 The worlds largest tree crusher. I'm not at all sure what it is supposed to do (why crush trees?) but it does look pretty threatening, especially if you are a tree. We stopped here this evening since the municipal campground was free, it wasn't in the middle of a metropolitan area, and the timing about right. 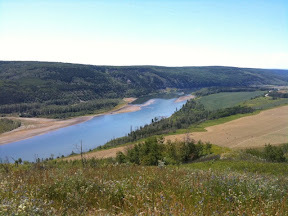 On the way, we went through a wonderful valley with the Peace River running through it. There seems to be a controversial hydro project threatening this valley. Or that's what I'm lead to believe from all the signs. We stopped at a turnout with a great view but it is starting to get really warm. I'm not sure how many more days we will be camping out. I'm typing this while walking around to escape the swarms of tiny flies. The campground wifi is broken so I'll post this whenever I can get a connection. Friday morning - Actually, it cooled off really nice last night and once it cooled off, the bugs went away. It looks like another beautiful day! Heading for the southern end of British Columbia today somewhere around Cache Creek. Almost in bobskoot territory. Free WiFi at the Quesnel Visitors Center. Friday evening - Cache Creek, BC. Stayed at a nice campground about a mile east of town. Pretty warm but the campground had a pool! I wasn't sure of our route either until I called the owner of the snow machine I'm hauling to find out which side of WA they were at. Thank you for the invite! We are bypassing Vancouver this time around.